England in only three days was a very enjoyable challenge! But given my love of manor houses, palaces, castles, cathedrals and fine dining we managed it quite well. I do hope to inspire the reader to travel in our footsteps! The flight from Sydney to London is arduous, to put it mildly. Flying with Qantas on QF1 means enduring a 14 hour flight to Dubai; a few hours in Dubai; and then 7 hours to London. The food on the flight was not only terrible, they ran out of meals. Feeling quite hungry it did not help to be told it is best to order food on line before the flight! QF1 arrives at 7 am on the same day as departure and we like to make good use of our first day. Clearing customs is another ordeal. Waiting in line for two hours to clear customs, with one unfortunate woman fainting in the queue and children wailing and moaning. But we were in our hire car by 9 am and heading for Danesfield House Hotel and Spa for a day of relaxation. This meant that he had no idea how to work the GPS in the car and I had to dictate every twist and turn using his i-phone. Major arguments raged as we constantly got lost. We saw every backstreet and by-way in England between Heathrow Airport and Henley. Then, suddenly, voilà, he lent on a button on the console with his elbow, and a GPS screen slipped up from its hiding place and started talking to him. It was perfect timing, divorce was imminent, and Danesfield House Hotel and Spa very close. It was a very hot day for England with temperatures in the 30’s, so it was a pleasure to fill in the time in the large neoclassical indoor swimming pool with our daughter and son-in-law. We also enjoyed lunch at the Illuminata Spa followed by massages and facials. Danesfield House has an interesting history. The House is set on 65 acres of formal gardens with lovely views over the River Thames and the Chiltern Hills beyond. I was not surprised to learn that 4000 years ago it was a resting place for nomadic tribes who paused to hunt and fish. This is exactly how we felt after such a long journey. In fact, the name ’Danesfield’ is derived from the fact that the Danish adventurers also rested here. This was indeed the perfect place to recover from our journey and enjoy the ambience of our surroundings and these lovely views of the Thames River. 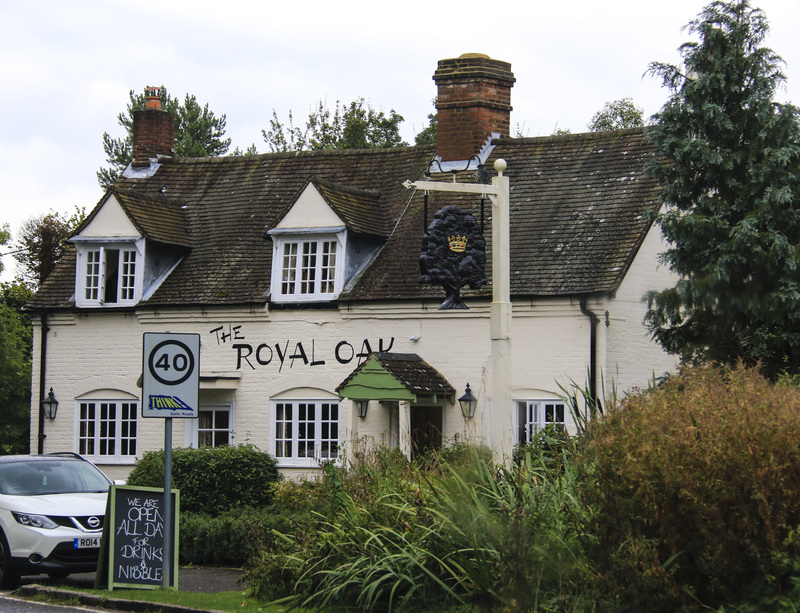 Later that evening for Gareth’s birthday, we went to the Royal Oak Pub in Marlow, for dinner. The food was so delicious I renewed my faith in the pub food of England. Giving him no choice in the matter, we figured the Hell-Fire Caves in West Wycombe would definitely be indoors. Following Gareth very closely AC was relieved to safely find himself at the entrance to the notorious Caves. Being a very wet day we had the Caves to ourselves! Here we are bravely getting ready for the scary experience! Sir Francis Dashwood originally had the caves dug out between 1748 and 1752 to provide chalk for a new road from West Wycombe to High Wycombe, thus giving employment to the villagers after a succession of crop failures. I suspect he had an ulterior motive because he later used the caves for the meetings and parties of the notorious Hell-Fire Club over which he presided as ‘Christ’ with his ‘Twelve Apostles’. Pathways through the Caves extend over a quarter of a mile underground following a very definite course. It was quite spooky in the tunnels, as you can see! From the entrance the path leads past Steward’s Cave, to Whitehead’s Cave, around a circle, past Franklin’s Cave and then to the Banqueting Hall where Venus keeps a watchful eye over the festivities. 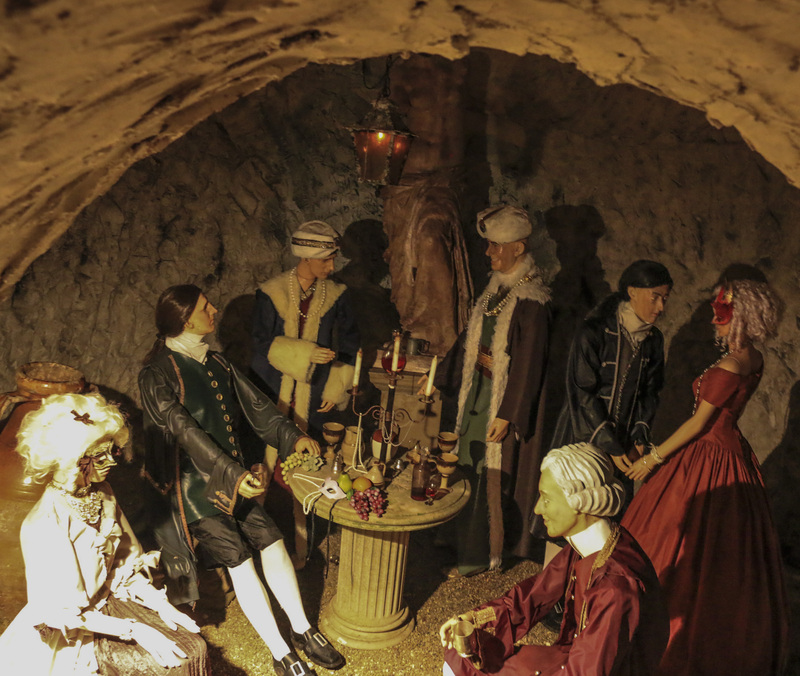 Sir Francis and his 12 apostles made up the Superior group of the Club and after the banquet, only his group were allowed to continue further into the Caves after they had made a toast to the ‘devil’. As they proceeded they walked around a triangular area which referred to the female anatomy, through the Miner’s Cave, and across the River Styx to the Underworld and the Inner Temple. Today the Inner Temple is occupied by John Wilkes, Lord Sandwich and Charles Churchill with Venus de Milo standing behind them. The ladies wore masks to hide their identity, but they wore a badge saying ‘Love and Friendship’ and were required to be of a ‘cheerful, lively disposition to improve the general hilarity’. The Temple is 300 feet beneath St Lawrence’s Church with its Golden Ball at the top of the hill. We were hoping to see the Golden Ball, but the rain was too heavy. All we saw was the cemetery near the Church and a man who sold us our tickets frantically searching for two lost children. Apparently they were in the Caves at the same time as us, but we encountered no one! Today these caves are available for Private and Corporate parties and filming. It is possible to have your own re-enactment of the original Hell-Fire Club meetings and opportunity to meet the resident ghosts, Sukie and Paul Whitehead! Marlow is known for its gourmet restaurants, so we braved the rain, and indulged in lunch at Villa d’Este Italian restaurant. For £15 I had an enormous bowl of mushroom soup, followed by another enormous plate of pasta and prawns. There was an amazing trolley of Italian cakes, but we were all too full to even look at them. After lunch we bravely set off on our own to Dover, via Hampton Court Palace. We arrived at Hampton Court Palace at about 3 pm, giving us only two hours to have a quick look! Given my interest in 18th century history, especially the Hanoverian Kings of England, I was very keen to see the apartments occupied by King George II and his wife Queen Caroline. So we headed straight for the “Georgian Story” apartments. 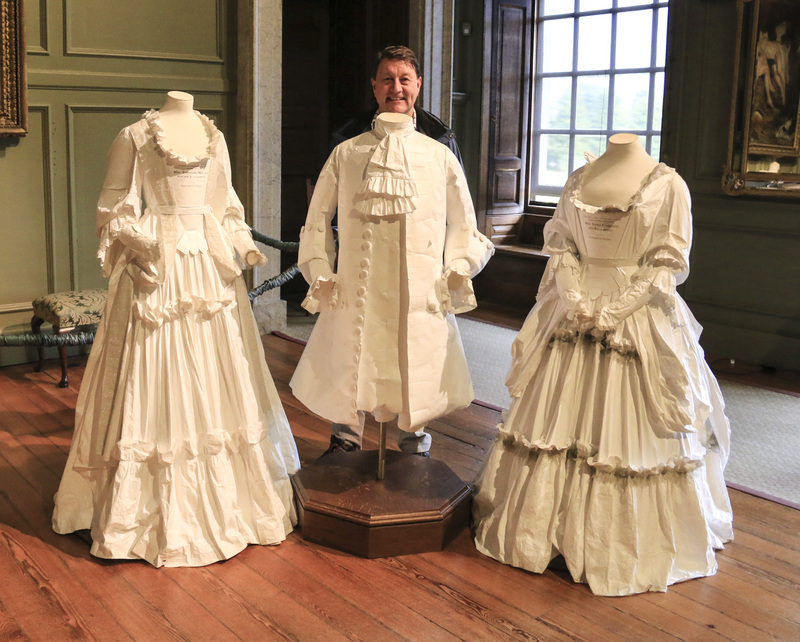 I liked the way the displays were arranged with paper figures, especially this one showing King George I with his two mistresses nicknamed the ‘elephant’ and the ‘maypole’, and of course, there is His Majesty in the middle. 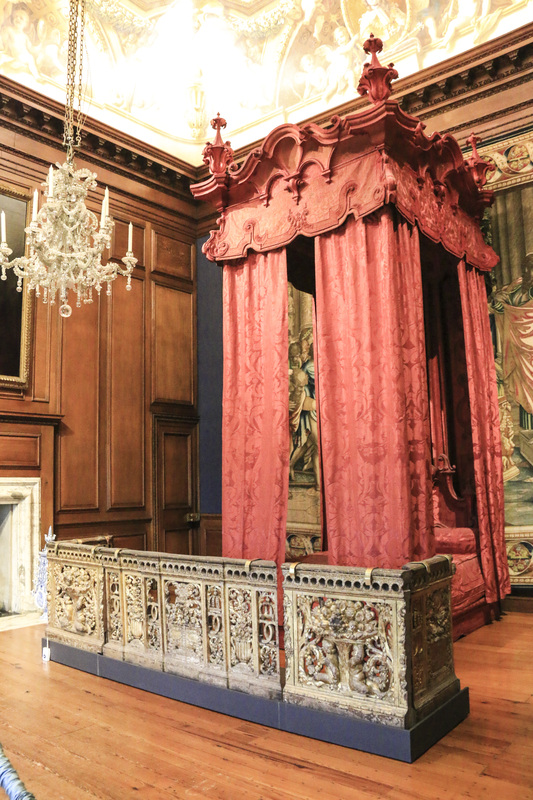 I found the State Bed with its enormous red curtains fascinating and had visions of King George II in one of his rages kicking his wig around the room, as he was prone to do! His temper tantrums were usually connected with his desire to return to Germany to see his mistress, the Wallmoden. Alternatively, he raged about his son, Fredrick, Prince of Wales, who was inclined to enjoy himself a little too much, especially at the Hell-Fire Club! He also missed his mother, Sophia Dorothea, who had been imprisoned by his father for 32 years. The other room I found interesting in these apartments was the Royal closet. 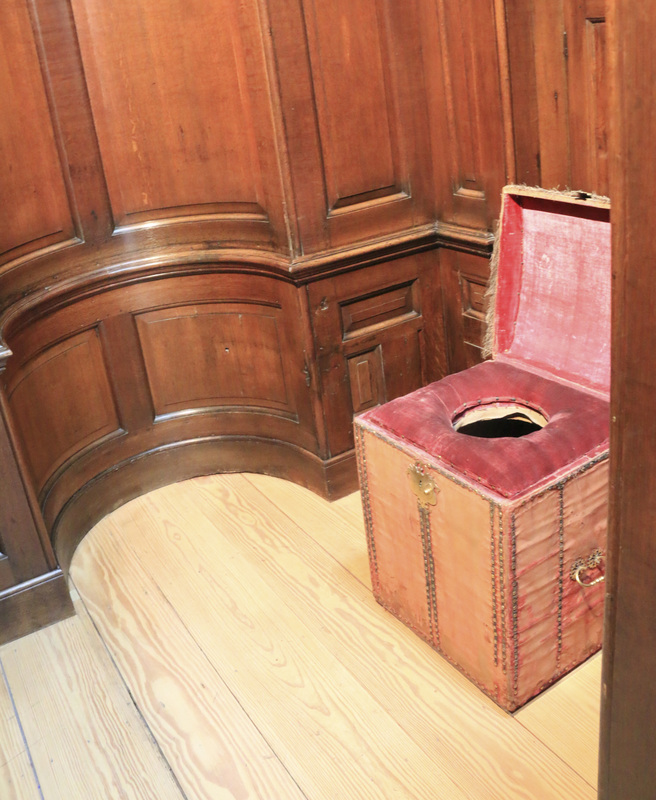 I do recall reading that King George II was found dead in his closet. My imagination went wild to think that this might be the very last throne upon which he sat! There were many amazing features to be seen in Henry VIII’s apartments, and I particularly liked this stained glass window featuring the great man! We had a quick look at the apartments of King William III. Here I am ascending the stairs to his apartments. The Royal Chapel dating from the 1520’s, it has many unique Royal features. I liked the blue Tudor pendant-vaulted ceiling and windows added by King Henry VIII. There was an original King James Bible published in 1604, an 18th century organ built for Queen Anne in 1711, and the Royal Pew used by all the Kings and Queens. The formal grounds have so much to offer, including a Magic Garden for children. But by 5 pm we could only give the gardens a quick glance. 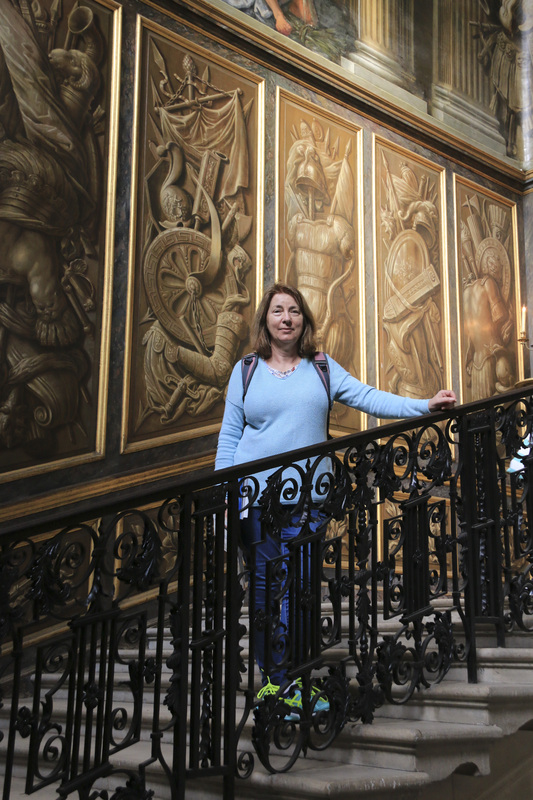 To do it justice, the Palace and Gardens require a full days visit. 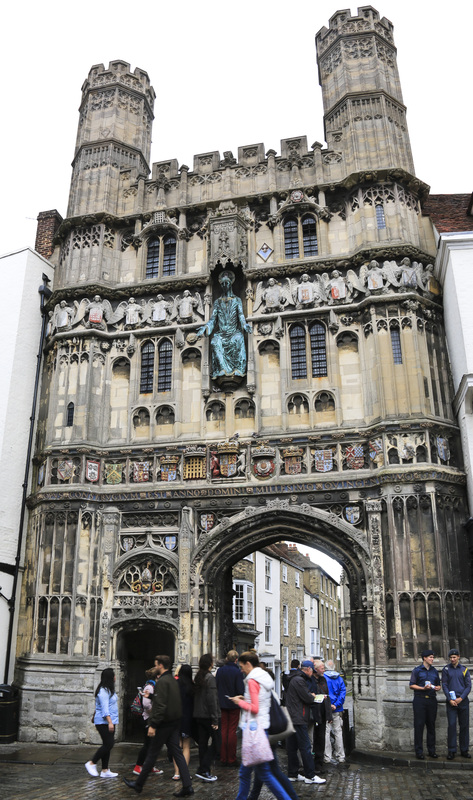 We chose the Marquis for its proximity to both Canterbury Cathedral and Dover. We did manage to find it in day light perched high above a very rural road. Not the ordinary Hotel, I was a little concerned about the quality of our room. Now, this Hotel did live up to its claim to be ‘a restaurant with rooms’! We had two nights of fine dining with truly excellent food with a taste of Kent’s local produce. In fact, I enjoyed the Kent tea so much I was given a little jar to take with me. The service was very friendly, the room comfortable and the food excellent! I was a little confused because we had chosen the Marquis Hotel, Alkham, as it was located conveniently close to both Canterbury and Dover enabling us to visit both locations in one day. Settling in for a long drive, we headed off through the countryside of Kent, over hills, dales and meadows and narrow winding lanes encased by tall hedges. Surprised to encounter traffic in these country lanes, I contented myself with gazing at the cows and meadows. After 15 minutes, I was a bit shocked to suddenly see the big city walls of Canterbury open up before us. So we ended up in a Marks and Spencer’s parking station, and headed through the medieval streets towards the spires of the Cathedral, finally arriving at the Christ Church gate. As we passed through the gate, under the figure of Christ in glory surrounded by angels, I knew our pilgrimage from Canterbury to Rome had begun. As luck would have it we entered the main door right when there was a Mass for pilgrims in the Crypt. So we hurried to the Crypt and joined in. But it was a group of Parishioners with their Parish Priest visiting the Cathedral. They were very friendly and we even joined in with their guided tour and found out an amazing amount of history and features of the Cathedral. We fully recommend taking a guided tour of the Cathedral. 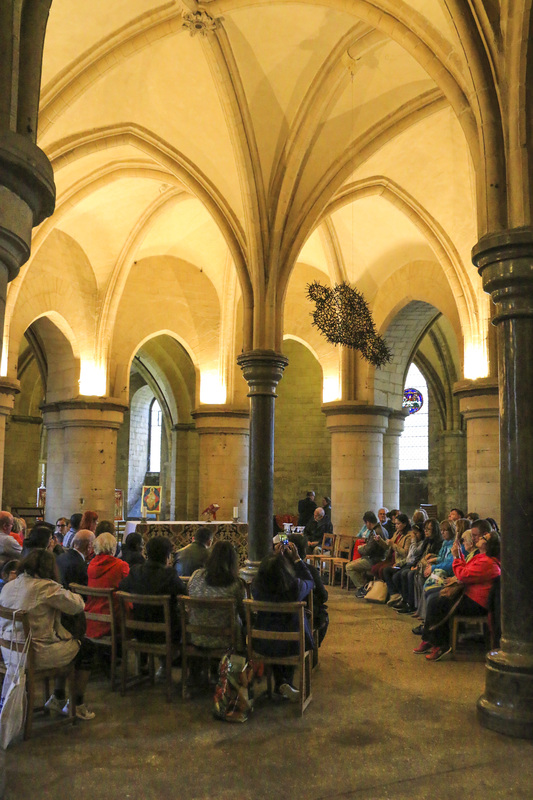 Thomas Becket was laid to rest in this crypt in 1170 after he was murdered. Today a sculpture named ‘Transport’ by Antony Gormley made of 15th century iron nails hangs from the ceiling above his burial site. I did find it a little scary that it seemed to be moving, but later found out that the sculpture aligns with magnetic north, and body heat rises from below causing it to swing out of alignment! We spent some time at the Cathedral viewing the interior of the Church, admiring the sculptured figures on the exterior, and then the grounds. I was quite surprised to see two new figures had been added – Queen Elizabeth and Prince Phillip have taken their place in the history of England standing tall on the west end of the Cathedral! 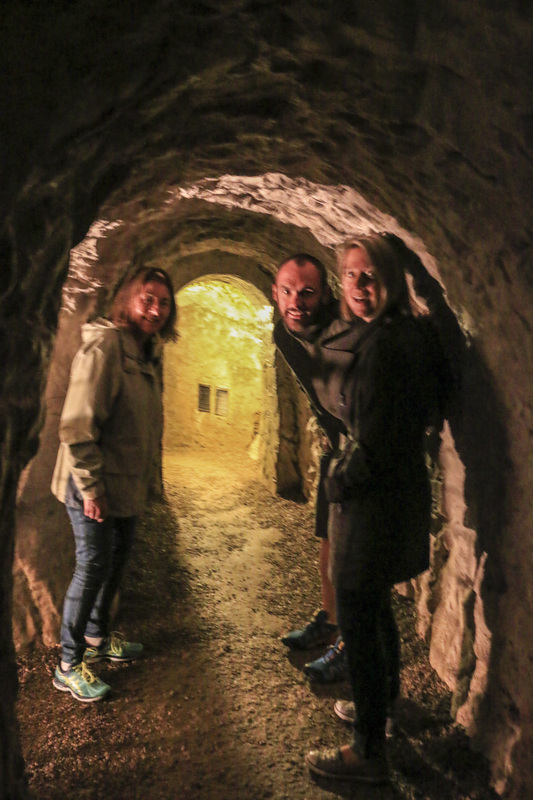 We were a little unsure what to do next and met a very friendly guide near an ancient water tower who thoroughly recommended a visit to Dover Castle, especially the tunnels used during WWII. It was 2:30 pm by the time we reached Dover Castle and we were very hungry! The Castle and its Keep are situated high on a hill top which meant lots of steep walking, and it was especially difficult to find food. The food in the Castle’s Cafes was not good and we were sorry we did not eat in Canterbury. We did manage to make our way to the Keep and through lots of dark passageways and medieval chambers to the top. The walls of the Keep were incredibly thick and it must have been a formidable fortress in medieval days. The views from the top of the Keep are stunning and the enemy would have been easy to spot. Then we walked through the medieval tunnels and saw the fortifications and weaponry ready to attack any enemy that might have stealthily got near the Keep. We very much wanted to see the secret war tunnels, and after a tiring down hill walk we found the entrance, but discovered a line of people waiting. We did not know that the tour had to be pre-booked, so we stood near the group of 30 and after a while 3 people left, so we were let in! It was totally amazing! There were presentations in a series of rooms within the cliff tunnels, leading us through the entire evacuation from Dunkirk to Dover. We heard the story of all the military and local people who bravely risked their lives to achieve such a massive evacuation. There is also a tour of the secret Hospital in the cliff tunnels, but our tour finished at 5:40 pm and the Castle closed at 6 pm. So we headed off towards the White Cliff walks and managed a late afternoon walk around the stunning white cliffs, so much a part of the history of England! Back to our room by 6:45 pm we were ready for our four course degustation, a glass of champagne, and a nice Bordeaux red. This was a very busy, but truly amazing three days in England! Tomorrow we leave England and cross the English Channel headed to Calais and France!